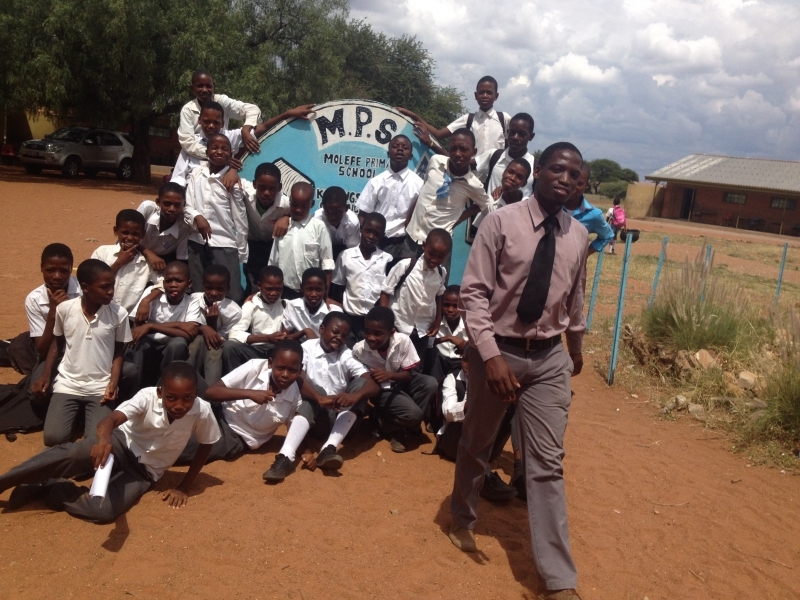 Primary school teacher Mothusi Joseph Kgomo with his students. Kopong, Botswana–Teacher Mothusi Joseph Kgomo wasn’t alone when he visited one of Jhpiego’s voluntary medical male circumcision (VMMC) sites on a warm day in October last year. Instead, he led a group of his adolescent male students from Standard 7 Primary School to the Kopong Health Center to participate in HIV prevention services and undergo circumcision in a collective show of support for good health. Five students, with parental consent, elected to undergo VMMC. Parents have been very supportive of the program, giving consent for their sons to participate in HIV-prevention services and undergo circumcision. In a country with an HIV-prevalence rate of 17.6 percent—the second highest prevalence rate in all of Africa—school campaigns have been an effective activity to build support for HIV prevention services and VMMC. Since Jhpiego began working with the government of Botswana in 2012 to provide VMMC services, more than 65 percent of the total number of clients circumcised in the country have been between the ages of 10 and 15. Scaling up VMMC in Botswana to reach 80 percent of HIV-negative adolescent and adult males by 2016 would avert more than 33,000 new HIV infections and save US$248 million in HIV/AIDS treatment costs. One of the best school campaigns recorded to date by the Jhpiego-Botswana team occurred from November to December 2013. The team attributed the success of this campaign to the improved collaboration and support from the school authorities and parents, whom they describe as key partners in the VMMC program. Schools, through the representative from the guidance and counseling committee, are responsible for the welfare of pupils, including the promotion of health and wellness. Kgomo, a member of his school’s guidance committee, exemplifies how teachers can be advocates of HIV prevention, not just through their involvement in these committees, but with parents and students as well. As part of his outreach, Kgomo, 27, works to dispel community myths surrounding VMMC that say it will encourage infidelity or affect manhood by decreasing sexual strength. He dismisses these as flimsy excuses by people who are “not man enough” to take responsibility for their life and health. Kgomo recommends circumcision to every man and freely talks about his personal experience to motivate and inspire others because he wants to see the men of Botswana “standing up” and being responsible for their health and well-being. Not all school authorities will allow health staff to discuss HIV prevention and VMMC with students and parents. And, there are some cases where children are afraid of pain or it is difficult to get parental consent for HIV testing and the surgical procedure. But together with the Ministry of Health in Botswana, and with funding support from the U.S. Centers for Disease Control and Prevention (CDC), Jhpiego continues to play a critical role in expanding and maintaining comprehensive VMMC service sites, recruiting and training clinical teams, providing direct services in hard-to-reach areas and conducting outreach activities for youth and adult men. Jhpiego’s work in the communities helps young men follow their role models, such as Mothusi Joseph Kgomo, whom they look up to for guidance and leadership on their health and well-being.